Watch for an email coming this week with details about your child's bus route, including pick-up and drop-off times. Bus route information will no longer be coming to you by mail. Instead, an email will be sent to families the week of August 13 that will include a website link, username and password for the Versatrans e-Link system. Please make sure to have an accurate email address entered in Skyward. You can update your email here. Tuesday, August 14: Grade 8 schedule pick up at Oak-Land and Stillwater middle schools. See calendar for times. Wednesday, August 15: Grade 7 schedule pick up at Oak-Land and Stillwater middle schools. See calendar for times. Thursday, August 16: Grade 6 schedule pick up at Oak-Land and Stillwater middle schools. See calendar for times. Friday, August 17: Pony Round-Up Day (grades 9-12) at the high school. Learn more. Wednesday, August 22: Back to school night at all elementary schools. Monday, August 27: Preschool open houses. 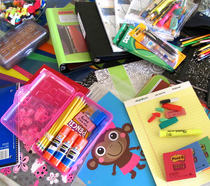 Families can “shop” for school supplies … for free! Items donated from community members through the Stuff the Bus campaign will be available on Wednesday, August 15 from 2 to 7 p.m. and Thursday, August 16 from 8 a.m. to 1 p.m. in the cafeteria of the Oak Park Building, 6355 Osman Avenue North in Stillwater. There is no paperwork to fill out and nothing required to pick up what you need. If you are unable to stop in one of these days please speak with your school secretary to make other arrangements. Thanks to United Way and Community Thread for sponsoring the Stuff the Bus campaign. To ensure all students have a successful start to the 2018-19 school year, the first day of school will vary to meet the specific needs of each grade level. Monday, August 27: First day of school, grades 6 and 9. Students in grades 6 and 9 will attend a special orientation day in their new buildings. Tuesday, August 28: First day of school, grades 7-8 and 10-12. Wednesday, August 29: First day of school, grades K-5. Elementary students and parents will attend a 30-minute Ready, Set, Go! Conference with their child’s teacher on August 27 or 28 to prepare for the first day of school. Read more. Tuesday, September 4: First day of preschool. Elementary students will be entering classrooms this fall with more than school supplies in their backpacks. Many will be coming with big worries, stress, anxiety and fears that can make learning a challenge. That’s why dozens of teachers across the district are learning to strike a pose, dim the lights and take a deep breath to make classrooms safer and more welcoming for all. 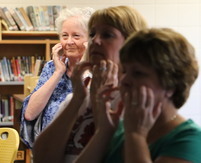 Yoga Calm is now making its way into elementary classrooms across the district. Read more. More and more of the youth in our communities are struggling with complex wellness issues, from anxiety and depression to drug addiction and suicide ideation. Our school staff are committed to supporting students and their families through any challenge that can negatively impact their ability to learn. Learn more about all the ways we are supporting students. Did You Know? The Wellness Center at the high school welcomes all students who wish to address issues dealing with mental health, chemical health, nutrition and health education. Learn more. About 200 teachers from around the country danced, rollerbladed and competed in sports stacking at a physical education and health conference hosted by Stillwater Area Public Schools. The conference was organized by Phys Ed Connections, a non-profit group formed by Stillwater educators who wanted to do more to support their students in the areas of physical and health education, Developmental Adaptive Physical Education (DAPE) and coaching. Read more. Stillwater Area Public Schools has received a Gold Medallion Award from the National School Public Relations Association for its comprehensive communication plan entitled, “Get to know the ‘new’ Stillwater Area Public Schools.” The Gold Medallion is a competitive award that recognizes superior education public relations programs, projects and campaigns in North America.